It’s competition season for the South Windsor High Schools hardworking Bobcats Robotics Team, and we at Grillo Dental extend our full support! As a former Bobcat robotics team member, Dr. Grillo knows precisely how the team is feeling which is why he decided to become a Bobcat Partner and sponsor this fantastic group of youths. 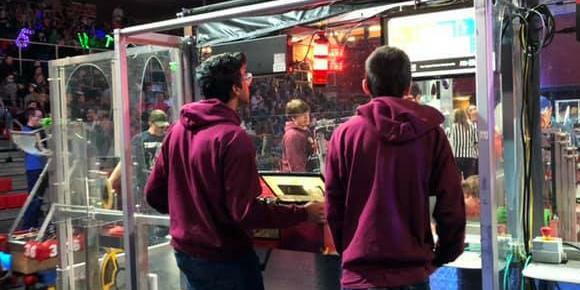 The full Bobcats Robotics Team is split into sub-teams with their own specialized function, but they’re united by a shared passion for learning and pursuing excellence through sharp robotics engineering. The Bobcats Robotics team is made up of exceptionally talented youths who compete with the same fundamental robotic-powered edge that empowers the very office equipment Dr. Grillo uses to care for his patients. The specific robotic resource in particular that South Windsor holds in common with Grillo Dental is CEREC and what that means for you is same day crowns. You know longer have to worry about temporary crowns or multiple appointments- you can leave your appointment with a renewed smile on the same day! Through CEREC, complex operations can be carried out with a new level of attention to detail through state-of-the-art computer model visualizations. In the past, there was a necessary and often troublesome wait time that patients had to endure before they could have their finished restoration product delivered to them after the preparation phase had begun. With CEREC, it’s possible for intensive restoration jobs in the dental office to be completed well within a single day. We understand how busy life can get which is why this type of technology is essential for us to have available to you and your family. Grillo Dental is fully committed to meeting all your family’s dental needs with a consistently held standard for professionalism and patient satisfaction. If you need the kind of precise dental care that CEREC can provide or have any other dental needs at all, call us to schedule an appointment today!